From the combustion of carbon to the synthesis of a vitamin, every chemical reaction has a story. Using web 2.0 tools in the classroom, pupils can research, create and share the digital story of chemistry. 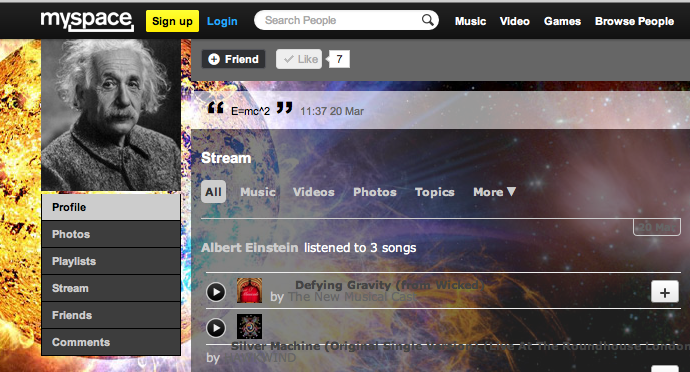 Create a Social Networking profile for a scientist explaining their discoveries. Find a list of scientists here http://www.famousscientists.org and see our Einstein page for inspiration. Find present day scientists on Linked-In or academia.edu or MyExperiment. What research are they doing right now? Create a class blog where students can record what they have learned. Really like this. Lends itself to famous musicians, artists, characters in history, literary characters etc.